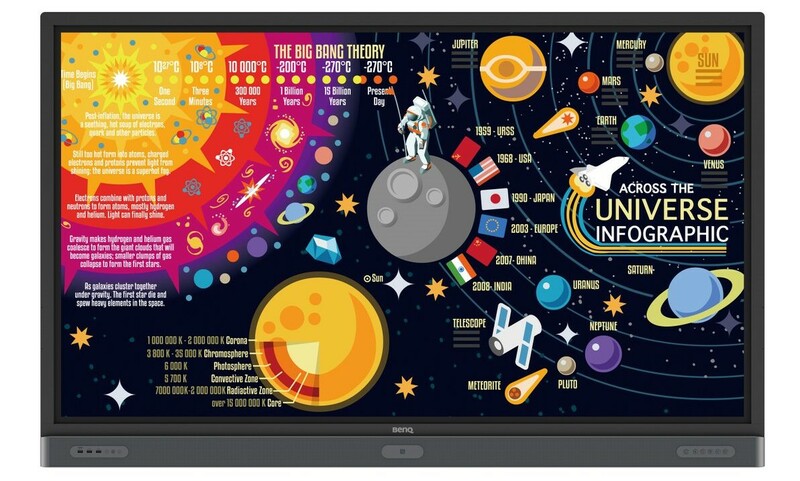 BenQ UK, the internationally renowned provider of digital lifestyle devices, today announces it has enhanced its full line of Interactive Flat Panels (IFPs) with Mainstream and Premium solutions for the education market. BenQ’s IFPs are optimised with a flexible user interface and classroom-ready solutions to support schools by bringing a truly healthy and collaborative learning experience into their classrooms. Both the Mainstream and Premium panels from BenQ boast a smart eye-care solution with an intuitive embedded motion sensor. For a comfortable viewing experience, the IFPs will automatically activate flicker-free, anti-glare and low blue light features by detecting the movement of users close to the screen. However, the BenQ Premium panels are also equipped with a germ-resistant screen which is powered by a multi-layer coating of a non-toxic enduring nano, ionic silver agent that kills germs accumulating on screen surfaces. The ionic silver’s antimicrobial feature remains effective even after thorough cleaning or long periods of use. The Premium panels also incorporate an air-quality sensor to help monitor CO2 concentration levels in classrooms and reminds teachers to adopt necessary mechanisms to keep CO2 at an ideal level. This thoughtful design ensures students can remain highly productive during class, whilst enjoying a much healthier learning environment. BenQ’s new range of IFPs also feature InstaQShare software, which is designed for seamless wireless presentation and collaboration. It allows for smooth streaming of both visual and audio files, including HD quality video, plus users can mirror content from mobile devices and invite up to 16 participants. The range also supports multi-touch capability up to 20 points, allowing more students to participate in discussion and engage in activities. The panels are also equipped with EZWrite annotation software, which is designed to illustrate ideas, record notes and brainstorming. It also comes with dual pens that allow users to write or draw in different colours simultaneously, plus intelligent handwriting recognition features. Come and see the new BenQ Interactive Flat Panel range, in addition to its collection of education solutions at Bett Show (23-26 January 2019 at ExCeL London) on stand B180.